Now with an 11 speed motor control from 1,000rpm to 3,600rpm for maximum comfort and control. This is the most powerful hand held electric massager available in the USA without a license. Designed for therapeutic and clinical use, this massager is at long last available for home use in the USA WITHOUT A LICENSE! This massager offers the ultimate massager experience for anybody who spends a lot of time on their feet or experince severe foot and leg pain. 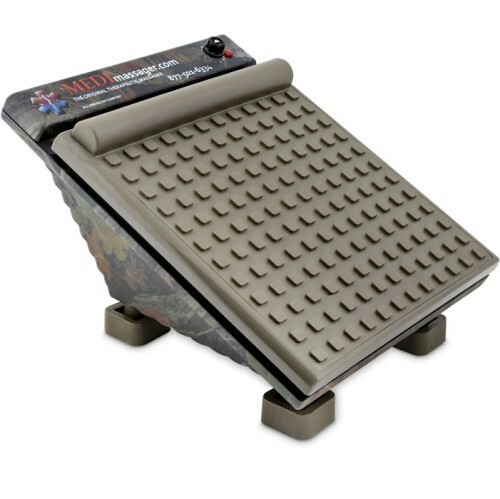 The MediMassager Foot massager is used clinically to treat patients with severe circulation issues and pain as a result of diabetes and neuropathy. Used by doctors and therapists around the world, this massager is an important tool for stimulating local circulation, easing muscle tension and alleviating joint pain and swelling. The ergonomic design is no accident. The foot pad had been designed at the optimal angle for most comfort whilst massaging. This Foot Massager is engineered to exacting standards in an ISO 9000-2001 manufacturing facility and is CSA certified for safety and reliability. Not only that, but this massager is also FDA certified for therapeutic use. The price includes an unprecedented 1 year full replacement warranty against defects and failure. An optional LIFETIME REPLACEMENT WARRANTY is available on the manufacturer's website. Compare this MediMassager with the competition and you'll realize that you don't have to settle for a lesser "copy cat" massager, purchase the very best for yourself - you are worth it!